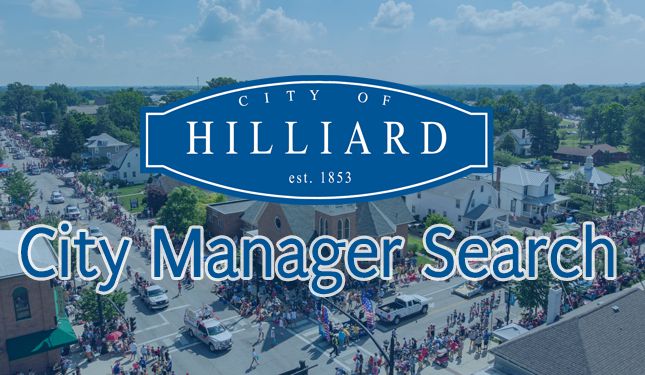 Hilliard City Council members are asking residents to take a brief online survey that will help guide them as they take the initial steps of seeking a City Manager. This survey was developed by The Novak Consulting Group, which has been hired to assist City Council in this search. The survey asks what qualities residents wish to see in a city manager, what they believe that individual’s priorities should being during the first year on the job, and what advice they would give this individual. Participants’ identities will remain anonymous. The survey results will be used during the recruitment process and will be shared with the Mayor and City Council. To take this 5-minute survey, just click this link before March 29. The new City Manager will officially take office Jan. 1, 2020, when voter-approved amendments to the charter become effective and the City switches from a Council/Mayor form of government to a Council/City Manager form of government. Hilliard City Council has selected The Novak Consulting Group to facilitate the search for its first City Manager, with a goal of having a candidate in place by the end of the year. “Novak Consulting Group is a highly regarded executive search firm that has helped cities in Central Ohio and across the country identify and hire city managers and other leaders for more than a decade,” said Kelly McGivern, Council President and a member of the Council subcommittee working on the search process. Novak Consulting Group was founded in 2009, when Julia D. Novak acquired Public Management Partners, a company with nearly a decade of professional management consulting experience. In addition to assisting with executive searches for government agencies across the country, Novak Consulting Group’s services range from facilitation and strategic planning to training, organizational development, executive coaching, and community engagement. McGivern said City Council members know that hiring a strong and experienced leader to serve as Hilliard’s first City Manager is a crucial process. “Having the assistance of a firm such as Novak will ensure the person selected for this position is able to help our community make the transition to a Council/City Manager form of government as smooth as possible,” McGivern said. McGivern said hiring the best candidate is more important than meeting a strict deadline, so there must be room for some flexibility in the timeline and process. She emphasized that Council Members want to ensure there is sufficient opportunity built into the process for Council, staff, and community input, including planned surveys and focus groups that will help determine the characteristics desired in a City Manager and what that person’s priorities should be. The search will begin in March with input to develop a profile of the ideal candidate. Novak Consulting will meet with City Council, City staff members, and key stakeholders to identify desired traits and experiences for the position. This process will include interviews, focus groups, and a community survey. Using this information, a job description and a recruitment profile will be developed. Once those are completed, Novak will advertise the position and begin the process of developing and cultivating a list of candidates. The firm will work with City Council to narrow the applicant group, as well as perform preliminary candidate screening and reference and background checks on finalists. Council anticipates a final selection of City Manager will be in the fall so the new manager will be in place before the end of the year. The new City Manager will officially take office Jan. 1, 2020, when voter-approved amendments to the charter become effective. Council Members have indicated that the preferred candidate might be brought on board in a transitional position in 2019 to learn the ropes and work with Mayor Don Schonhardt during the fall. McGivern said City Council will continue to communicate with the community as this search continues. City Council took its next official step toward transitioning to its new form of government Monday night when it created a committee to begin the search process for Hilliard’s first city manager. Council President Albert Iosue appointed fellow Council Members Andy Teater, Pete Marsh, and Vice President Kelly McGivern to the Transition Committee, with Teater to serve as chair. City administrators Julia Baxter, the City’s Director of Human Resources, and David Ball, the Director of Communications, were appointed to assist the committee with the process. The Transition Committee will hire a professional consulting firm to develop appropriate recruiting materials, accept applications, and work with Council throughout the process. There is no timeline each step of the process, but Iosue said there will be opportunities for community members and City staff to participate and provide feedback about the kinds of skills and qualities they believe Hilliard’s first city manager should possess. All seven members of City Council will be actively involved in the interviews and hiring. Hilliard’s first city manager is expected to begin work on January 1, 2020. That’s the date a voter-approved amendment to the City Charter takes effect, transitioning Hilliard from a strong mayor form of government to a council/city manager system. While a mayor is elected by voters, a city manager is a professional administrator hired by City Council to oversee the day-to-day operations of the City. Voters approved the change to the City Charter in November 2018. Read more information about the charter amendment and how a city manager form of government operates.